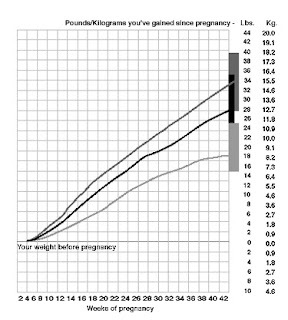 According to this chart, I'm set to be at about 30 pounds or so by the time I deliver and another site I found says I should target my gain at about 33 pounds. Plus last time around I didn't exercise at all and now I've been keeping a pretty consistent routine of an hour of exercise 2 x week. When I overdo it, I pay later in the day, but lately I think I've found a balance and have felt alright as long as I rest later in the day. Overall the projected weight gain according to this chart isn't too bad, but at the rate I'm going with food (Roscoe's again on Thursday), I'm pretty much doomed if I don't slow down. How can anyone use the words "Roscoe's" and "doomed" in the same sentence?? That has to be blasphemy. You're doing great - try not to let your doctor's 5 lb "limit" buzz around your consciousness too much. You're growing a baby, your body knows what it's doing (and will probably gain the same amount of weight no matter what you do...save for binging nightly on waffles and fried chicken...) You've got enough to worry about, let your body handle this one.